Find artworks, auction results, sale prices and pictures of Emma Eleonora Meyer at auctions worldwide. "Et Interieur fra den Kgl. Women decorating porcelain at Den Kgl. 496(appendix), here bought by Kunstforeningen. Literature: The work is mentioned in the article on EmmaMeyer in Weilbach Dansk Kunstnerleksikon, vol. 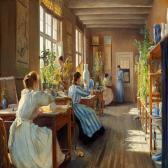 Emma Meyer's sister was JennyMeyer - a well-known porcelain painter at Royal Copenhagen. It is obvious that Emma Meyer found inspiration when visitingher sister at work. One of the lovely young ladies in thepresent painting might even be Jenny Meyer. Emma Meyer: “Udsigt fra Frk. Foghs Have i Skjold”. 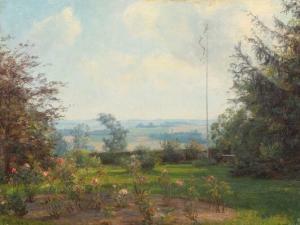 Garden scenery. Signed and dated EM 1920. Oil on canvas. 47.5×61.5 cm. Forest glade with a blooming elder. Signed and dated E. M. 14. Oil on canvas. 47 x 71 cm. 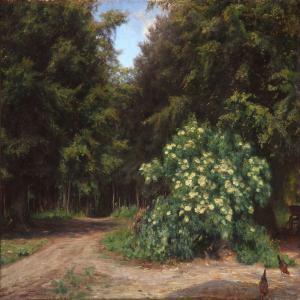 Emma Meyer: Forest glade with a blooming elder. Signed and dated E. M. 14. Oil on canvas. 47 x 71 cm. View of Bassano, Northern Italy. Signed Em. 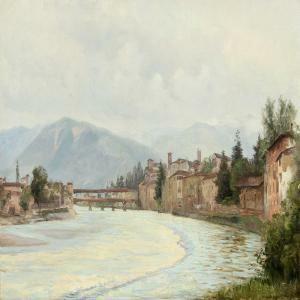 Bassano 06. Oil on canvas. 36 x 56 cm.